These days, though, his really major contribution to the scene is the Bundle of Holding, which as well as being a very cost-effective way of getting a big stack of PDF-based RPG products with a common theme, system or setting for customers is also, for publishers, a good way to get some of their back catalogue a bit of attention that it might not otherwise have received languishing in the dustier corners of DriveThruRPG. 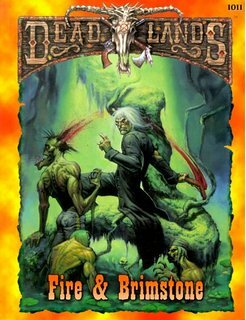 One of the bundles I’ve picked up was the Deadlands Classic bundle. 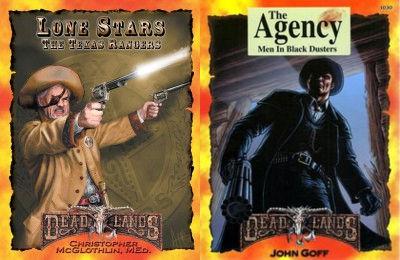 Although Deadlands is still actively supported in the form of the Deadlands Reloaded supplement line for Savage Worlds, I found the Savage Worlds system annoying in its presentation and bland in practice when I tried it, enough so that I sold off my copy and didn’t fancy repurchasing it plus a supplement to play Deadlands, the chance to get a significant chunk of the original line – which I’d heard had a more flavourful system – was too good to pass up. Here’s what I think of my haul. 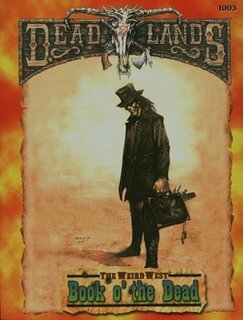 Aside from a brief in-character introduction to the setting in the form of a frontier newspaper at the start of the book, the Weird West Player’s Guide focuses on introducing people to the Deadlands rules in a clear, uncluttered, and easy to understand fashion. Deadlands is essentially a “combine the appropriate stat and appropriate skill” system, but it isn’t based off simply adding the stat and the skill together: instead, your skill gives you a number of dice for your dice pool and your stat gives you which specific type of dice you are rolling. Rather than adding the dice together or counting successes, you take the best single roll any of your dice gives you, with the caveat that if you roll the maximum number on one of the dice then that die explodes. (It will be noted that explosions happen more often with smaller dice, so if you are rolling say 5D4 against someone rolling 1D12 you’re actually still in with a fighting chance). Various embellishments to this core system are based off poker chips and playing cards, which is a nice tactile way to add an Old West feel to proceedings which I’m kind of a sucker for. As well as being used to determine initiative, playing cards make a regular appearance in relation to some of the more supernatural elements of the setting – perhaps most famously, you have the hucksters, practitioners of the European occult tradition as preserved and described in code in Hoyle’s Book of Games, but character concepts available with supernatural capabilities include steampunk-style mad scientists, religious folk of both a Native American and an Old World-derived persuasion, and so on. There’s even a slim but real chance that death isn’t the end in this game – if you play your cards right you can return as one of the Harrowed, who on the one hand command some really fun powers but on the other hand are also a living embodiment of the corruption at the heart of the setting. I’ll talk about the setting stuff more in relation to the Marshal’s Handbook, where most of the core setting material appears in this edition, but I want to note here how incredibly gonzo this whole setup is – and also how brilliantly modular it is. The nice thing about all the weirder character types is that they build on top of a basic system which is fully featured enough to support a wide range of non-supernatural but still decidedly cool Wild West characters, and to have just as much fun playing them as one of the Weird Westerners. As a result of the fact that the Weird West isn’t intrinsically built into the core rules, as a result it’s easy to trim away any features you are disinterested in if you’d prefer to run in something other than the default setting. Don’t like steampunk? Excise ghost rock and the mad scientists. Don’t want to turn real-life religious practices into mechanically statted-out superpowers? Don’t use the rules for shamanism or religious faith. Prefer to play a straight Western game, or at least a game where the PCs are all normal people facing down the supernatural with nothing but their irons and grit to back them up? Ditch all the supernatural character types entirely. 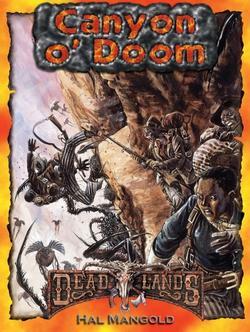 This is probably part of the reason for the game’s commercial success in a market where even the most successful Western games like Boot Hill or Aces & Eights have been at best niche successes rather than major hits – Deadlands provides enough tools that you can run it as fantasy or alt-history SF or horror if you wanted to, but there’s also a pretty fun Western game at the heart of it anyway, making it one of the most versatile toolkits for Western-themed RPG play out there. The list of changes between this edition and the game’s original edition consists of a single brief page at the back here, which frankly makes sense since this and the Marshal’s Handbook are for the most part just a reorganisation and rationalisation of the content of the original core book and The Quick and the Dead, the original hardcover setting book and rules companion. And really, this isn’t a game which demands much of a do-over; considering that the original game was good enough to win major industry awards as soon as it came out, as well as getting hype from Gary Gygax and winning over Bruce Campbell to a sufficient extent to prompt him to write a gushing intro to this edition, Pinnacle must have realised that now was not the time to mess with a winning formula. Providing both a few hidden aspects to the rules as well as an expansive setting writeup, I think the main thing that the Marshal’s Handbook offers over the original one-book presentation of the rules is the more in-depth look at the setting it provides. 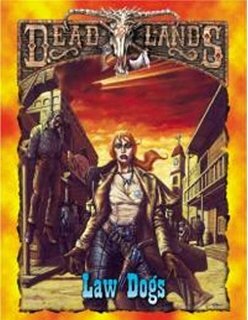 A wide range of iconic Western locations are given writeups through a Deadlands lens, with archetypal towns like Tombstone and Deadwood being given a particularly detailed summary, and you could pretty much run a sandbox Deadlands campaign just with this book. At the same time, some of the specifics of the setting do bother me. It’s in an alternate history where the Confederacy still stands and the war between the North and South is grinding on interminably, but at the same time the Confederacy has given up slavery. Historically speaking, this is not just whitewashing, it’s also just plain absurd. A mere look over the CSA Constitution, which was specifically designed to make damn sure the institution of slavery would never, ever be legally scrutinised or curtailed so long as the Confederacy stood, is more than enough to settle any revisionist arguments about the causes of the war and the ideology of the Confederates. “States rights” might have been the rallying cry, but let’s be real here: the only rights being challenged by Washington that caused even remotely enough anger to actually lead to secession was the right to own slaves. Now, to a certain extent there’s commercial and playability factors at work here. First off, Deadlands specifically takes place in a West where gender and racial equality are the order of the day, which is pretty much necessary if you are going to run a game with people who’d rather real-world sexism and racism didn’t creep into their escapism. Likewise, Pinnacle’s main market was the USA, including the Southern States where a number of people are still sensitive about the whole Civil War thing. In discussing this online I’ve been accused of wanting to portray the CSA like a bunch of Nazis, and… well, frankly my accusers have a point, since I tend to think of the Confederacy and Nazi Germany in similar terms. The ideology of slavery is a monstrosity just like Naziism was; I see little moral distinction between plantation owners and concentration camp commandants, save that the Nazi camps were more militaristic in their operation and their operators didn’t have to worry about buying new slaves. Yes, ordinary non-slaveowning members of the public fought for the Confederacy in the name of protecting their homes and states’ rights; equally, ordinary blokes who didn’t vote for Hitler joined the Wehrmacht to defend Germany from what they perceived as renewed aggression from the Treaty of Versailles’ backers and Stalin’s expansionist goals. That doesn’t change the fact that those Wehrmacht soldiers were fighting for a leadership and an ideology that was deeply poisonous, just as the Confederate soldiers were fighting for an ideology and a way of life that was morally indefensible. I don’t have many Southerners at my gaming table; those I have with don’t have much nice to say about the Confederacy. As it stands, the Confederacy in Deadlands is corrupt at its heart anyway – however, it’s corrupt in a way that the Confederacy could get itself off the hook if it finds and gets rid of the evil infiltrator. That isn’t enough if you know enough history to realise that the Confederacy was institutionally poisoned by ideological commitment to slavery from the start; the Union may have had its own issues (Lincoln wasn’t even 100% committed to emancipation as of the start of the war and some of the Union states were slaveholders), and the Founding Fathers may have been slaveowners as well, but at least the Union was in a position where it could conceivably reform itself to live up to the ideals of its Constitution, so that its grand statements about all men being created equal would not stand as rank hypocrisy. The Confederacy without slavery, conversely, is simply unrecognisable as the Confederacy; literally the only major respects in which the Confederate Constitution differed from the US Constitution was that the Confederate Constitution included provisions declaring that slavery would never, ever be made illegal. I’m not sure which way to jump on this point – whether to just have the Civil War end as it did historically and have the dark forces that prolong the war in the canon background work on some other scheme, or to have the Confederacy still be slave-owners and set them up as radically more villainous figures in the setting than they are presented as here. (I also want to work in Victoria Woodhull and Frederick Douglass’ President-and-Veep ticket for the Equal Rights Party in the 1872 election into the equation, and perhaps manipulate the timeline to boost popular support for them, at least Out West – if you want to have equal rights to have progressed substantially further than they did at this point in history, which the Deadlands authors seem to want to do, you could at least put the spotlight on those historical figures who were actually promoting them at the time, but Woodhull and Douglass are nonentities in the timeline here.) My gut feeling is to take the Confederacy out entirely – if nothing else, the Texas Rangers are supposed to be heroic figures in Deadlands, and I can’t see them doing that if chasing down escaped slaves is still part of their official duties. 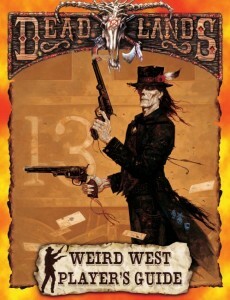 If I had one critique of the book, it’s that – whilst it does give details on how several varieties of banditry and criminality are pulled off – it tends to advocate against running an outlaw-themed campaign, suggesting a vision of the Western genre focused on white-hat heroes facing off against black-hat villains; here Deadlands tends to advocate a style of Western I don’t recognise from the Westerns that I personally enjoy. Still, despite a note of disapproval I’m disinclined to concur with, I find Law Dogs to be a particularly good supplement for Deadlands, particularly since it shares with the core rules an adaptability which allow it to have some applications even in the most mundane of Western campaigns – or allows you to take any intermediary position between the full-bore silliness of the core setting any anything more subtle than that. The Agency, the second law and order-themed entry in the bundle, is the supplement dealing with the Union’s top secret group dedicated to investigating and fighting supernatural threats. A large chunk of the book is dedicated to a pair of in-character Agency publications, one a briefing on the Agency’s history as an offshoot of the Pinkertons and one an overview of standard operating procedure. The rest of the book consists of a mix of Agency-focused character generation options, special Agency equipment, updates on metaplot and pointers on running an Agency-focused campaign. Indeed, The Agency contains enough player-facing stuff and sufficiently few referee’s secrets that a large chunk of it can serve as the major player supplement for a campaign in which the PCs all work for the Agency. For my part, however, I don’t think that is a path I am going to take, and I have little use for the supplement. Part of this is because I prefer the earlier iteration of the Deadlands setting, where the Union’s ghostbusting was actually leased out to the Pinkertons. The Pinkertons are a real, live, flavourful bit of history to play with; the Agency, conversely, is not just counterfactual, but actively feels anachronistic and out of place in the setting. Wrapped in executive orders and rhetoric about national security, and overtly riffing on the Men In Black myth, the Agency feels like a modern-day X-Files conspiracy transposed to the Deadlands setting, and given that this came out in 1999 that sort of makes sense, but it still doesn’t feel like a natural part of the setting to me. Another thing that puts me off is the large emphasis on steampunky gadgets. 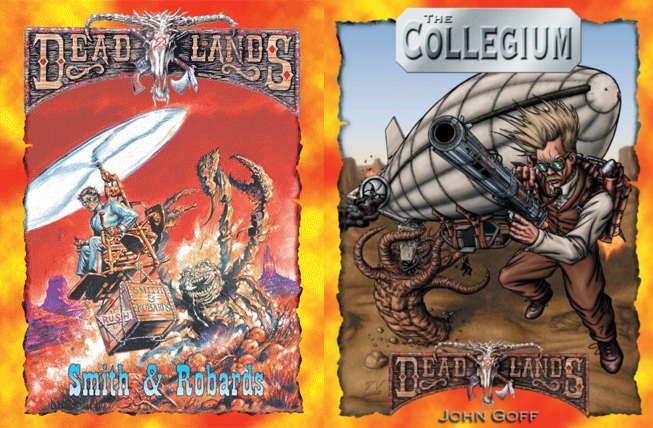 The more Deadlands leans on tryhard generic steampunk nonsense, the less I am interested – for me, and I suspect most people, the iconic tone-setting image of the setting is that undead gunslinger on the front of the core book, and he isn’t wearing goggles or mucking about with an ornate brass jetpack, he’s standing in front of a conventional (but still impressive in its own right) train. The attraction of the Weird West to me is in the Weird, and there’s nothing weird about steampunk any more and hasn’t been for some years – if anything, at this point it’s downright conventional. The main thing that makes me find this supplement underwhelming, though, is that running a game of all-Agency PCs doesn’t quite feel like the Western tone I’d be going for in a Deadlands campaign. Though having a shared group allegiance can be useful to counteract the genre’s typical fascination with and encouragement of loners, working at the beck and call of a powerful organisation from Back East is just enough outside the frontier ethos to feel dissatisfying to me, and I’d rather PC factions had more local roots. As for Lone Stars, it’s basically a rerun of The Agency, only for the Texas Rangers. On the plus side, the Rangers feel vastly more thematically appropriate to me than the Agency does. This is massively outweighed on the negative side by the fact that they work for the Confederacy and no, just no. On top of that, the player’s section provides a range of helpful survival tips, as well as some rules tweaks to lend Huckster PCs a bit more long-term survivability. The GM section offers a range of Huckster-themed conspiracies, some for the greater good and some to sabotage it. On the whole, this supplement more or less does what you expect supplements of this nature to offer up, but doesn’t accomplish a whole lot else. These are the two mad scientist-focused supplements in the bundle; Smith & Robards has the cute conceit of being a mail order catalogue describing various wacky inventions (useful if playing Wile E. Coyote in a Toon game, of course! ), whilst The Collegium describes an institute of mad scientists with guidelines on how player characters of all different varieties might get involved with them. Whilst these might be interesting if you find yourself particularly in tune with Deadlands‘ take on wacky steampunk science, as we’ve well established by this point I’m not, and I found that these supplements prompted more eye-rolling than interesting ideas. This is the Old World religion supplement. (Indigenous religions are covered in Ghost Dancers.) On the one hand, I am slightly impressed by the range of different faiths it covers – in particular, it also covers Buddhism and Daoism, acknowledging the healthy contingent of Chinese immigrants that often get forgotten by stories of the Old West. At the same time, its coverage of them is to a certain extent a bit shallow – the entries seem to be cribbed from encyclopedias and at some points seem to introduce some glaring errors. The one which jumped out the most to me is the mention of the Episcopal Church having women in the priesthood – er, sorry Pinnacle, but not in the century you happen to be writing about. Now, to be fair, this is an alternate history game, and so it’s possible that something happened in the alternate history of Deadlands to get women ordained in the Episcopal Church substantially earlier than in real history – but we’re not told what it is, and as a result it give every appearance of being a genuine mistake. And of course, once you slip in an error like that, you lose my trust that you’re actually discussing the specifics of faiths I’m less familiar with accurately. On top of that, some of the setting elements they quite deliberately introduce just don’t sit right with me. For instance, apparently the Confederacy has a substantial Chaplain Corps, at least some of whom are explicitly stated as being truly Blessed and able to do miracles as described in these rules. This is a bit of alt-history – they were founded in 1863 by Leonidas Polk after, in this timeline, he resigns his commission as a general to set up the Chaplain Corps, whereas in our own timeline despite being known as the “fighting Bishop” Polk remained a general until his death in battle – and this explicitly puts them on the ground before Gettysburg unleashes all sorts of supernatural weirdness, and more crucially before the Confederacy votes to revoke slavery (a move which is explicitly against the Confederate Constitution, but hey! Never mind! Gotta keep those Stars-and-Bars-loving customers happy! Grumblegrumble…). This means that the game book is telling us that God is explicitly endorsing an organisation of individuals who were explicitly fighting to maintain slavery – and let’s not mince words here, the South was more than happy to use religious pretexts to defend the institution of slavery back in the day. Now, to give what limited credit it is possible to give to the book, they do at least note that there’s also a Chaplain Corps in the Union Army. Nonetheless, whilst I can see the point to a certain extent of not saying that God was absolutely on the side of one half of a war or another, and religions by their nature are subject to a wide range of interpretation. On the other hand, a Christianity which is comfortable with fighting on the side of an institution battling to maintain slavery, and whose members get a metaphysical thumbs-up from God for doing so, is not really a Christianity I want to include in a game, and is moreover a Christianity which seems to spectacularly miss the point of Christianity as it’s understood by anyone I would want to game with (or want within several miles of my social circles). In addition to this, I find the expanded treatment of miracles here uninspiring. 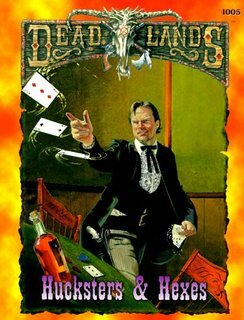 The miracles in the core Deadlands rules are nice and broad and open to wide interpretation. which works for what they are trying to do there; here they are nitpickingly specific, like D&D cleric spells. On balance, I’m not impressed. This is the Native American supplement; I didn’t have great hopes for it, but although it is flawed I actually think they pulled it off better than they might have. It does use the term “Indian” quite frequently, which may bug some, though the whole naming issue is a massive minefield anyway, and at least some indigenous peoples of North America are entirely fine with it; also, the fact remains that it would have been a term widely used by English-speakers during the time period anyway, and unlike many terms from that time at least hasn’t attracted the sort of baggage a full-blown racial slur would carry. Pinnacle were clearly aware that they were walking into a huge minefield here, and they make a point of treading carefully, cautioning the reader not to confuse what they have presented with historical fact and providing a bibliography of sources for learning more. (That said, as far as I can make out that bibliography doesn’t include any contributions from actual Native Americans, which may be an issue.) More to the point, the book is not, as I feared, simply dedicated to providing cool magic powers for shamanic sorts – though there is a bit of that, and obviously it would be kind of not-OK if there weren’t since everyone else gets whizzy faith-based powers in this game after all. A substantial chunk of the book is instead dedicated to providing an overview of major tribes and tribal alliances, managing to walk a fine balance between overwhelming the reader with information and providing enough discussion of the politics and cultural practices of the peoples in question to get across the point that “Native American” should be considered as broad and diverse a category as, say, “Asian” or “European” or “African” – major, important cultural distinctions exist between tribes, they don’t all speak the same language and believe the same thing, and cultural practices and ways of life differ both from tribe to tribe and from location to location. In addition, we get useful overviews of the various Native American states that the return of overt magical might to the world has allowed them to carve out and defend against encroaching colonists. This goes a long way towards providing more depth to Native American characters in Deadlands, and it is backed up by some useful system bits. Extensive advice is given both on adapting existing character traits to suit Native American characters (since many of the traits in the core book are written with a Eurocentric spin – “Luck o’ the Irish”, anyone? ), and the brief notes on Native American spiritual and magical practices in the core rules are substantially expanded on. This does have the slightly unfortunate side effect of trying to present the tribes as having a unified cosmology they more or less all subscribe to, though this is alleviated to an extent by the way the spirit world here is explicitly stated as manifesting through the filter of people’s cultural perceptions (or, in a group of mixed culture, the perceptions of whoever is spiritually strongest). That said, the book isn’t perfect. In particular, whilst its structure provides a good model for how you could produce a decent Native American supplement for such a games, some of the specific content filling out that structure is badly handled. The thing which jumped out at me was the use of the archaic term berdache for Two-Spirit people, accompanied by the blanket statement (which to my knowledge isn’t actually historically supported) that such people were always men who balked at going into battle and were made to dress as women as a shaming strategy. Between this and some statements about gender roles that I am not sure are entirely accurate, the book seems to make deviations from fact based less on the necessity of making interesting gaming material and more on the centuries-old practice of applying Western norms and prejudices to Native American cultures. This supplements expands on the Harrowed – characters who have returned from the dead but who face a constant battle for control over their actions with the dark powers animating them. The Harrowed are a signature feature of the Deadlands setting – they’re in the core book, and were in it from the start (indeed, one of them appears on the cover art), and any PC on dying has a chance of becoming one of them. 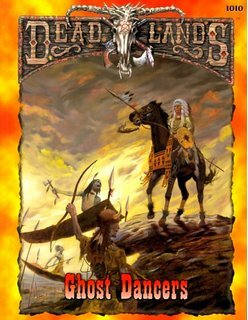 In fact, I seem to remember seeing an anecdote somewhere that the Harrowed were the focus of the first Deadlands playtest campaign, which cast the players as a group of soldiers who were ambush and at first thought they had miraculously survived – only for later events to reveal that they didn’t. Harrowed characters according to the core rules are already quite powerful, and although the tweaks to the system offered here does give a bit more teeth to their battle for control over their inner demons they still are fairly powerful character types. That being the case, I might not use this book for a game where a PC became Harrowed partway through – not unless they ended up playing that character for so long that they started needing additional options for advancement and development, anyway – but the expanded range of powers and options it provides makes it ideal for running a game where everyone is Harrowed. This could be an interestingly intense roleplaying experience, or could turn into a frenzy of superpowered gunslinging. In the 1990s, game designers were hot on pushing the idea that creating powerful characters and enjoying their powers was a lowbrow and unworthy practice – White Wolf led the charge, but even D&D was not immune to game designers encouraging referees to put hard limits on character power for the sake of fighting “powergaming”. That’s why I was very pleased to see that Pinnacle overtly refuse to get drawn into such elitism. Whilst tips for running more thoughtful campaigns are provided, they make it clear that a perfectly acceptable solution to the issue of “My players just want to play undead gunslinger superheroes” is to embrace that and give ’em what they want. Even better, they explicitly present that as “Option One”. Even though they seem to be residually affected by the game design zeitgeist, this mostly takes the form of warning that running around doing the undead superhero deal may end up feeling shallow and pointless after a while, but that’s actually true enough and the mere fact that they suggest that referees should indulge that if it’s the sort of thing they would enjoy running is truly refreshing to see in an RPG supplement put out in the mid-to-late 1990s. 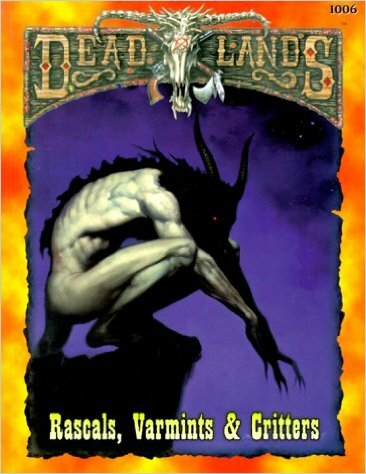 In fact, this is probably my favourite supplement of the lot in the bundle, because out of the elements of the core book which are unique to the Deadlands setting I find the Harrowed by far the most interesting and evocative. This is basically the Deadlands take on the Monster Manual, but thanks to Pinnacle’s practice of trying to put something of interest to players as well as referees in more or less every supplement aside from actual published adventures it’s got quite an interesting format. There’s rules for statting out dogs and horses as animal companions, which is a great idea given how important horses are in your average Western and how every RPG is made better with doggies, and before the rules section statting out and giving the real story behind the various monsters described there’s a bestiary presented as an in-character publication, which is fantastic if you want to give the players a dangerously-unreliable set of rumours to use when monster-hunting. You also get details on the Explorer’s Society, an in-game faction which might, at its upper echelons, actually have a better handle on the whole “world descending into supernatural chaos” situation than the Union or Confederate governments do. Especially useful if the supernatural, fantastical, and horrific aspects of the setting are more interesting to you than the steampunk bits. Actually, it would be more accurate to say that this is the Deadlands answer not to the Monster Manual, but the original Fiend Folio, since a large proportion of the creatures presented were actually cooked up by Deadlands fans and submitted for consideration to be included in the supplement, much like the Folio was a compilation of monsters submitted to White Dwarf in its early years. Like the Folio, the diversity of people involved means that the creatures presented are similarly highly varied in theme and tone, though developers Tim Beach and Hal Mangold have done a good job of keeping the standards of quality control high. This is an adventure which involves the player characters latching onto an expedition to find a lost city hidden in the Grand Canyon. It combines a frustrating linearity (there’s even a railroad journey early on!) which doesn’t provide much scope for varying player motivations with one of the Deadlands series’ worst habits: the way both the authorities and others try to pressure the PCs into suppressing any information about supernatural goings-on during the adventure. 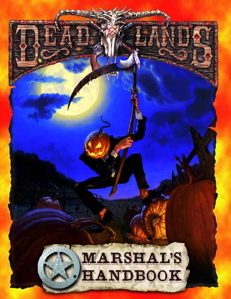 I can see the point of a Masquerade-type suppression of knowledge of the existence of the supernatural in campaign settings which are supposed to resemble the real world, but Deadlands is explicitly and avowedly an alternate history that has been made “alternate” thanks to the eruption of supernatural forces into the world, so it doesn’t make sense for player characters to not be able to tell the world about their exploits and display proof of the supernatural to all and sundry. Indeed, part of the reason I’m not keen on the Texas Rangers or the Agency, aside from the reasons I outlined above when discussing their splatbooks, is the way they are used as heavy handed mechanisms for suppressing knowledge of the supernatural in the setting. (This is also why if I did use the Pinkertons in Deadlands, I probably wouldn’t quite use them in the same way as canon handles them.) Frankly, they’ve got better stuff to do, like actually combating supernatural threats themselves and undermining each other and doing counterespionage. It feels faintly silly that two governments would get the vapours to such an extent over the possibility of plebs finding out about the supernatural in a time period where, thanks to their religious convictions, a very sizable proportion of the population already believed in the supernatural in one form or another anyway. I’d say so. Proportionately, I liked a little more than half the supplements, and given the price cut the Bundle offers I still think I got way more than my money’s worth. The charities the Bundle helped out are the National Center for Missing and Exploited Children and the Sea Shepherd Conservation Society, which are decent causes that I don’t regret donating to, and whilst some of the content in the books seems a bit badly handled or inappropriate to my eyes I’m reasonably confident that if they were rewriting the books today Pinnacle would do a better job. That said, I’m really not keen on the attempt to make the Confederacy viable good guys, though – I’d say that if you wanted to play a character from the Confederacy who is clearly heroic, you would really need to have them either be fundamentally disillusioned with the Confederacy’s goals or someone who was cajoled into fighting but didn’t especially want to and took the first opportunity to go AWOL and head West they could. “Actually, the Confederate government may have a point and could be reformed if a few bad apples were removed” isn’t an idea I’m too happy about. As I understand it, this is still a feature of the setting, so between that and the fact that I’m not enormously keen on Savage Worlds (especially if it displaces the more flavourful mechanics in this line) I think I’d rather pick this stuff up on the Bundle than pay full price for the current line.